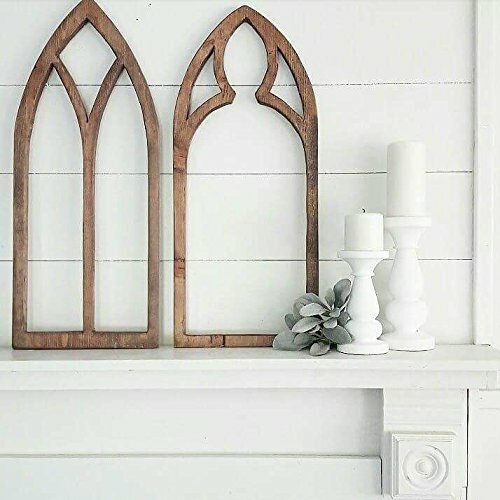 Inspired by Gothic Cathedrals and Farmhouse charm, we bring to you our very own hand-cut window frames. We cannot love these enough. They look darling as a pair! Made from thick, high quality Pine wood and stained with our signature dark walnut. Comes ready to hang with hook attached. Lightweight and easy to mount on the wall or prop on a mantel. Each window is made to order and hand-cut. Expect character of the wood and cut to be unique and one of a kind. The piece is for decorative purposes only. Measures 26" x 11"
br/> ***All wood signs and cut-outs are hand-made by us in our small studio and wood-shop. We thrive on the natural characteristics of the wood we use to create our pieces and value the unique knots and variety of grain. Each piece of wood is handpicked for production and is totally unique with its own characteristics and individuality; some with a little more or a little less distressing. We use a dark walnut stain on our frames and yours may show lighter or darker than pictured depending on the density of the wood. This is the beauty of handmade wood products. We want each and every one of our customers to receive a unique and original creation. br/> ***SHIPPING NOTICE AND RESPONSIBILITIES*** Please make sure your address is correct before placing your order. We are not responsible for incorrect addresses. If your package is returned, you are responsible for the additional shipping service. In the event of damage in transit or lost packages, please email us immediately. br/> ***When hanging any decor over a crib, safety is of the utmost importance, we recommend space between the wall and the crib when hanging any wood or heavy wall art. If you have any questions about this product by Three Arrows Collective, contact us by completing and submitting the form below. If you are looking for a specif part number, please include it with your message.